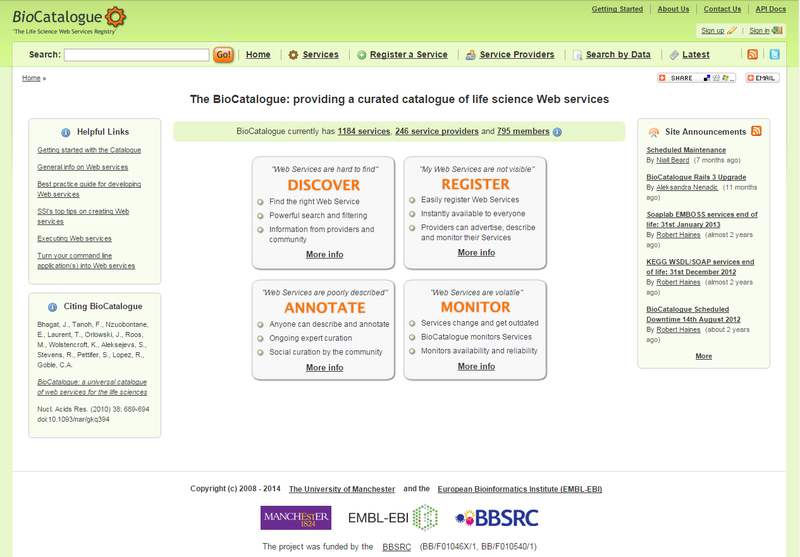 The goals of the BioCatalogue are: (1) to provide a single registration point for web service providers and a single search site for scientists and developers, (2) to provide a curated catalogue of life science web services, (3) to encourage providers, expert curators and users to provide oversight, monitor the catalogue and provide high quality annotations for services, and (4) to establish BioCatalogue as a place where the community can find, contact and meet the experts and maintainers of these services. The BioCatalogue is a BBSRC funded project. The project is a joint venture between the University of Manchester and the European Bioinformatics Institute (EMBL-EBI).